Actress Betty Garrett poses at her home in Los Angeles Dec. 16, 1997. Garrett recounts her experience as a victim of the film industry blacklist in "Betty Garrett and Other Songs, which she wrote with Ron Rapaport. LOS ANGELES (AP) — Betty Garrett, the vivacious Broadway star who played Frank Sinatra's sweetheart in two MGM musicals before her career was hampered by the Hollywood blacklist, has died in Los Angeles, her son said Sunday. She was 91. Garrett died Saturday at Ronald Reagan UCLA Medical Center, most likely from an aortic aneurysm, said her son, Garrett Parks. Garrett had been in good health and taught her usual musical comedy class at Theater West, the non-profit organization she helped found, on Wednesday night, but Friday checked into the hospital with heart trouble, and died with her family at her side the following morning. Her movie career was brief, largely because of the Red Hunt led by congressmen who forced her husband, actor Larry Parks, to testify about his earlier membership in the Communist Party. Parks had won stardom and an Academy Award nomination as best actor for his dynamic portrayal of singer Al Jolson in the 1946 "The Jolson Story." But in 1951, he was called before the House Un-American Activities Committee, and he admitted that he had joined the Communist Party in 1941 and left in 1944 or 1945. Pressed to name his fellow members of the party, Parks pleaded not to be forced "to crawl through the mud as an informer." He agreed to testify fully in executive session. He made one more film, "Love Is Better Than Ever" with Elizabeth Taylor, then his film career was over. "It was a dark period, a foolish, foolish period," Garrett said in 1998. "It destroyed a lot of lives and ruined my husband's career." Garrett had also had a brief dalliance with the party but wasn't called to testify, perhaps, she said, "because I was nine months pregnant with my second son, and they didn't think I would be a good witness." Garrett's stage career began to click when she sang the show-stopping "South America, Take It Away" in "Call Me Mister" on Broadway in 1946. That brought Hollywood offers, and at 27 she signed a contract with MGM, then the king of musical movies. Her son said aside from her family she considered the work she would do for MGM her life's highest point. "She was very proud of the MGM musicals," Parks said. Particularly memorable was "On the Town," the Betty Comden, Adolph Green and Leonard Bernstein musical about three sailors on leave in New York City. She played the comically aggressive cab driver who pursues Sinatra (singing the racy "Come Up to My Place") while his pals, Gene Kelly and Jules Munshin, team up with Vera-Ellen and Ann Miller. Besides the two pictures with Sinatra, she appeared in "Words and Music" and "Neptune's Daughter," in which she and Red Skelton sang the Oscar-winning song "Baby, It's Cold Outside." MGM dropped her after Parks' testimony, and she received no film offers until she co-starred with Jack Lemmon and Janet Leigh in the 1955 musical version of "My Sister Eileen," playing Eileen's (Leigh's) sister, Ruth. Unable to find much work in Hollywood, she and Parks hit the road with a musical act. It proved a hit in Las Vegas, London and other cities. When the bookings thinned out, Parks became a home builder. He died in 1975. Garrett maintained a busy career in theater and television. She played recurring roles in "All in the Family," as the chatty friend of Edith Bunker who duels with Archie, and "Laverne and Shirley," as a landlady who married Laverne's father. She garnered an Emmy nomination in 2003 for guest actress in a comedy series for an appearance on the Ted Danson sitcom "Becker." Over the years, she also had sporadic roles on Broadway, including parts in "Spoon River Anthology" in 1963 and "Meet Me in St. Louis" in 1989. She was back on Broadway in 2001 in a revival of Stephen Sondheim's "Follies." 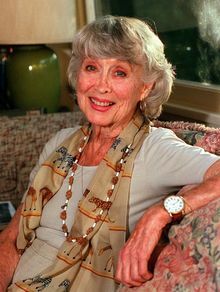 In 1998, she published her autobiography, "Betty Garrett and Other Songs," which was the title of her one-woman show. She also taught and appeared in plays at Workshop West, which she helped found in the late 1950s. Asked in 1998 if she retained bitterness that she and Parks were blacklisted, she replied: "It's not my nature to be bitter. What I feel is deep sorrow. We both, I think, were just on the verge of becoming really big stars, particularly Larry. And it just went crashing down." Betty Garrett was born in 1919 in St. Joseph, Missouri. Her father, a traveling salesman, moved his wife and daughter to Seattle. He died of alcoholism when Betty was 2. She attended Roman Catholic schools though she wasn't a Catholic. She had demonstrated a talent for dancing and acting, and her ambitious mother took her to New York where she had won a scholarship at the prestigious Neighborhood Playhouse. Betty was 17. Garrett's stage debut came with "Danton's Death" at Orson Welles' Mercury Theatre in 1938. Later shows included "All in Fun," ''Something for the Boys," ''Laffin' Room Only" and "Bells Are Ringing." She also danced with the Martha Graham troupe, worked summers on the Borscht Belt, and even wore a fake jewel in her navel as a $25-a-week chorus girl in the Latin Quarter in Boston. In addition to Garrett Parks, a composer, his wife Karen Culliver Parks and her granddaughter Madison Claire Parks, she was survived by her son Andrew Parks, an actor, and his wife Katy Melody. The family did not plan to have a funeral, but was planning a memorial service for later in the month.